How Do You Treat a New Wooden Roll Pin? Wooden rolling pins are often passed down through generations, and antique rolling pins can be obtained at thrift shops and antique shops. Older rolling pins may require a light treatment with mineral oil before use; however a new wooden rolling pin should require only a light washing. When you are ready to use your wooden rolling pin, lightly dust it with flour to prevent pastry dough and other foods from sticking to it. 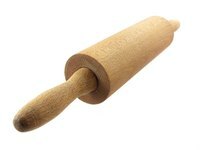 Wash the rolling pin before its first use by wiping it down with a wet, soapy sponge. Rinse thoroughly and allow the rolling pin to dry completely before putting it away. This will prevent moisture damage. Store the rolling pin in a cool area away from heat sources. Johnson-Rose Corp. recommends this prevent the wood from cracking. Wipe the rolling pin with a clean cloth dampened with mineral oil it if you notice the wood beginning to crack. Most wooden rolling pins do not often need to be treated in this way--as long as they are not overly exposed to water. Avoid soaking the rolling pin in a tub of water, and never clean it in the dishwasher. Which Is Better, a Marble or Wood Rolling Pin? Can I Use Cake Flour as a Non-Stick Surface for Cookies?